Food and Feed Safety Systems and Analysis discusses the integration of food safety with recent research developments in food borne pathogens. The book covers food systems, food borne ecology, how to conduct research on food safety and food borne pathogens, and developing educational materials to train incoming professionals in the field. Topics include data analysis and cyber security for food safety systems, control of food borne pathogens and supply chain logistics. 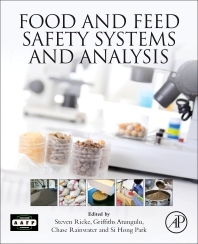 The book uniquely covers current food safety perspectives on integrating food systems concepts into pet food manufacturing, as well as data analyses aspects of food systems. 11) The viable but non-culturable state in Listeria monocytogenes, what are the implications? Dr. Ricke received his B.S. degree in Animal Science (1979) an M.S. degree in Ruminant Nutrition (1982) from the Univ. of Illinois and his Ph.D. degree (1989) from the Univ. of Wisconsin with a co-major in Animal Science and Bacteriology. From 1989 to 1992 Dr. Ricke was a USDA-ARS postdoctorate in the Microbiology Department at North Carolina State Univ. He was at Texas A&M Univ. for 13 years and was a professor in the Poultry Science Dept. with joint appointments on the Food Science and Technology, Molecular and Environmental Plant Sciences, and Nutrition Faculties and the Veterinary Pathobiology Dept. He has been honored in 2002 as a Texas Agricultural Experiment Station Faculty Fellow. In 2005, he became the first holder of the new Wray Endowed Chair in Food Safety and Director of the Center for Food Safety at the University of Arkansas. He is also a faculty member of the Dept. of Food Science and the Cellular and Molecular Graduate program.